Engin Ceber was arrested at 1400 on 28 September in Istanbul. A political activist, he was taking part in an unsanctioned demonstration. 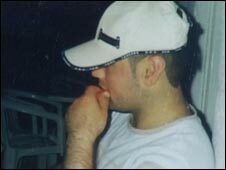 Twelve days later he died of a brain haemorrhage. The autopsy report details "widespread internal bleeding in all parts of the body due to blunt trauma," sustained over a week. It concludes that the injuries are consistent with "crude beating, which is a method of torture". A series of reforms passed as Turkey prepared to open EU accession talks led to a sharp fall in allegations of torture and ill-treatment. 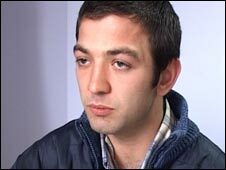 But the death in custody of Engin Ceber has put the conduct of Turkish police and prison guards back in the spotlight. At their lawyers' office, three other activists arrested with Engin described the beating that began as they were dragged from the demonstration by police. They say the ill-treatment continued at the station and when they were remanded to Metris prison the following day. "The police made us lie on the ground, and they kicked us," Ozgur said. "They beat me on my side, kicking and punching without stopping." The detainees put up passive resistance throughout. "The prison guards hit us in the back and the waist with plastic chairs. They broke one over Ozgur's head," continued Cihan, describing what happened in prison when they refused the order to stand and be counted. "They said they'd beat us until we obeyed. They didn't just use their hands and feet, they used iron bars from the door. They were really enjoying it." The three claim that abuse continued for a day and a half. The autopsy report shows Engin Ceber continued to sustain serious injuries for a week. Sixty police and prison officials will stand trial in connection with his death. Four prison guards have been charged with torture, which carries a life sentence. The prosecutor's indictment describes how one guard repeatedly slammed Engin Ceber's head against the iron door of the cell. As details of his death emerged, Turkey's justice minister made an historic public apology. Engin's father says that was no comfort. "My son left home healthy, and he was tortured to death," said Ali Tekin. "When I saw him, one side of his body was pitch black with bruises. The back of his head had almost disappeared. They claim there is zero tolerance for torture, but that's a lie." The statistics do show a sharp drop in reports of torture and ill-treatment after 2003. Turkey improved police and prison-guard training then, and introduced better safeguards for detainees - including immediate access to a lawyer. But more people reported torture or ill treatment to the prime minister's own Human Rights Directorate between January and June this year than in the whole of 2006 or 2007. Non-government groups chart a similar pattern. A new report by Human Rights Watch (HRW) documents a continuing culture of police violence. It also suggests that tighter control of formal detention facilities is pushing police abuse onto the streets. "If they choose to beat someone, then it won't necessarily be in the police station now," says Emma Sinclair-Webb, Turkey researcher for HRW. "It might be when they are arrested, in the police car during transfer or during a demonstration. The problem has been diffused." This time last year, 26-year-old Feyzullah Ete was with a friend in a park near his home when four police officers approached and demanded their identity papers. Within minutes Feyzullah was dead following a sharp blow to the chest. One policeman has been charged with intentional injury leading to death; a police statement at the time claimed Feyzullah fell. "I used to trust the police. 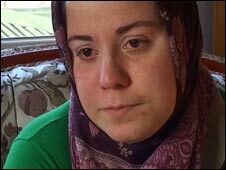 I thought they were there to protect us," his wife Necla confides, at her home. "Now when my daughter sees a policeman she hides behind my skirt and asks if he will kill her." Police in Istanbul and Ankara declined BBC requests to comment on reports that police violence is increasing. But the executive director of HRW, Kenneth Roth, said that while Turkey's interior minister was open to their comments and suggestions, Deputy Prime Minister Cemil Cicek showed a "contemptuous'" attitude to their concerns and refused to acknowledge their findings of abuse in Turkey. "I left the meeting wondering if the government's approach is to protect human rights or to violate them," Mr Roth said. A new report by the prime minister's human rights office said the government had conducted "every possible legal reform" to prevent torture. It suggests "some police officers… may not act in accordance with human rights" as a result of poor education and overwork. In its own investigation, Human Rights Watch claims changes to the law on police powers in 2007 have helped create a trigger-happy force with the authority to conduct arbitrary stop-and-searches, open to abuse. It also cites a culture of impunity. Justice ministry figures show that legal proceedings for torture and ill-treatment were completed against 1,357 security officers in 2007, most of them police. Of those, 193 were convicted. But only 48 of them were given prison sentences of any kind. "Until you get accountability in actually bringing these people to justice, you will continue to perpetuate the 'we are untouchable' culture among the police," argues Emma Sinclair-Webb. "If [Turkey] wants to change the problem, that's the way to begin."